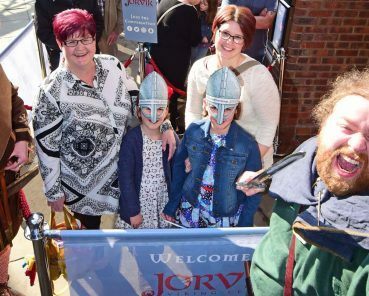 Crowds in Coppergate were basking in the sunshine for the long-awaited re-opening of the JORVIK Viking Centre in York this morning, following its £4.3 million re-imagining. The sights, sounds and smells of 1000 years ago are now once again giving visitors an immersive experience of the Viking-age city. 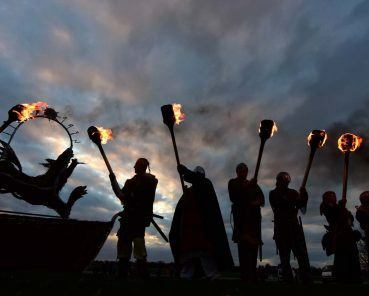 The huge wicker wolf was burned as night fell in a ceremony involving Vikings carrying flaming torches at Bustardthorpe Field in York, marking just one week until the Vikings return to their home for the last 34 years – JORVIK Viking Centre. The enormous wicker totem burned bright as it was surrounded by Viking warriors and settlers.